Using the most advanced technology from Polycom, GMSS offers state-of-the-art video conferencing capabilities for depositions and other meetings at almost any location in the world. We provide you the convenience of face-to-face communication without the cost and hassle of associated travel. GMSS also provides multimedia streaming services in conjunction with the latest intereactive technologies such as Live Deposition and Remote Counsel. Live Deposition streams real-time depositions anywhere on the globe and Remote Counsel enables remote and secure participation in meetings or depositions by video or audio conference with the provision of additional note making, chat and annotation features. In addition to the provision and use of the latest video conferencing system technology, GMSS can also provide state of the art video conferencing system facilities at several convenient locations across the island of Ireland. GMSS utilizes the latest video conferencing systems and associated administration to deal with all of the logistics, remove the hassle and allow you to focus exclusively on the substance of your meeting or conference. GMSS’s video conferencing system also facilitates your in conference communication with rapid access to video conference support media such as interactive graphics, text and audiovisual display technology. Contact us by email at gmalone@gmss.ie to discuss your requirements, or at the number above. We provide highly trained and experienced support staff to assist our client’s video conferencing requirements at all times and to ensure that technical issues do not interrupt the substance of your video conference. 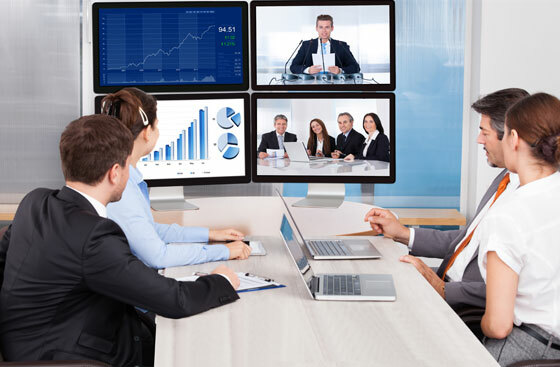 We are known for our ability to set up and delivery video conferencing systems at short notice and that is why we are regularly retained by public agencies, market leading corporates and private clients for their video conferencing needs across the island of Ireland.